If you have been keeping up with our latest blog series, we have been discussing the benefits of cooking with your child. 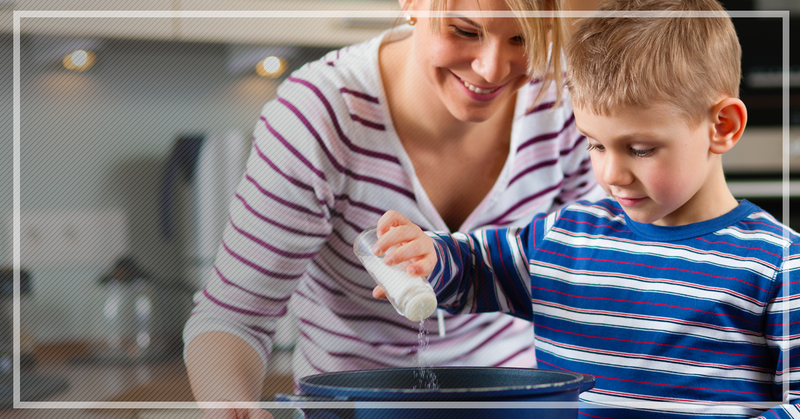 Cooking with your child takes learning out of the classroom and into your very own home. Your child will be learning about science, mathematics, and even improving their reading skills. Spending this time with your tiny one will strengthen the bond that you two have and share together. watch the learning and fun unfold right before your eyes. Confidence is something that children should experience but many parents forgets its importance in child care and development. When you cook with your child, especially recipes you know are simple and your child can excel at, will give them a boost of energy and the confidence to take on anything. Positive reinforcement such as this will help your child shine as they become older and start to take tests, and have homework assignments. When you cook with them and they love the tasty treat they helped make, they will feel a sense of accomplishment. They created something, and mommy or daddy loved it! This will give them the drive to keep trying new things and wanting to be successful in the future. As you have learned, cooking is much like science. There are formulas and recipes to follow to make sure your dish tastes just right. Not only is cooking a science, it can also be considered an art. Cooking with your child can be a fun and creative experience. Baking especially can be artistic because your child can decorate the tasty treats afterward. Additionally, if you want to a spice things up a bit you can make a recipe all your own, with using just the basics and then let your imagination run wild! Teaching your child what flavors blend together and what doesn’t will give them a better understanding of cooking in general. At Stew Leonard’s, you child will be creating fun dishes that they will be excited to talk about under our child care and yours! Communication, and knowing how to implement it correctly, is a key skill for any person, including children to possess. When you are cooking or baking with your child, clear communication is imperative for your dish to come out the way you intended. One way to elicit communication is when you are reading the recipe and giving instructions, make sure your child clearly understands what you are asking of them. Your children are molded by your actions, so they will mimic the way you give directions to others. A child who knows how to clearly communicate will be able to better express their emotions. They can clearly tell you if they are sad, mad, or even happy. Less tantrums are always going to beneficial for you. Our child care in South Windsor makes sure we touch on communication every day. Learning to communicate early for a child will be able to help later in their development and beyond. Working with your child in the kitchen, helps them create a creative and fun treat or meal and will form a strong bond and connection between the two of you. Tying all aspects of the cooking process together encompasses a lot of skills for your child to take on. You only have so much precious time when your child needs to be nurtured. Soon enough, they will be able to take care of themselves and won’t need your guidance as much as they used to. The time you get to bond with your favorite little person is time to savor. The other part of the connection is your child connecting the dots of all the concepts involved with cooking. If you have a treat that didn’t come out right, they will be able to start to figure out why. A good example is if a dish burns or is overcooked. This is resulting in the issue of time management. They will be able to understand there was too much time used and the next go around they need to use less. If a recipe does not go according to plan, make sure you are still letting them know what an awesome job they did and how accidents happen! You don’t want to stunt their newly gained confidence. At our child care, like cooking, we incorporate all these attributes into our child care. Foundations For Learning in South Windsor has well-rounded programs to make sure your child’s care is always a fun, exciting, and an educational experience. That’s why we partnered up with Stew Leonard’s for some amazing and enjoyable cooking classes. Stew Leonard’s is a great and healthy local business that wants to help kids eat healthy and have fun. Schedule your cooking class today and contact us and Foundations For Learning for questions!